from the blue chair: 12 Weeks of Christmas FreeSpirit Blog Hop & a Giveaway! 12 Weeks of Christmas FreeSpirit Blog Hop & a Giveaway! I was asked several months ago to participate in a Christmas blog hop with FreesSpirit fabrics. My tutorial is up on their blog today as the last one of the series. I created a tutorial for these bags which are made from fabrics from the Fortiny line by Tina Givens. My original idea was to create a bag that could be used for gift giving rather than the paper gift bags and tissue paper that are thrown away after one or two uses. This is a very simple tote. I even imagined adding a ruffle to mimic the tissue paper often used in these bags. I knew this would look very girly. The fabric provided to me for the project wasn't girly at all, and I couldn't see the ruffle idea working. I finished the above bags a couple months ago and shipped them off to FreeSpirit, but the other night I decided to give the ruffle idea a try and pulled out some fabric I had on hand from Kumari Garden Holiday by Dena Designs. I admit I had a lot of fun putting this together, and Miss A claimed it immediately. This is the medium size bag with a nice puffy ruffle. We're all about Fancy Nancy around here so this bag fits right in. If you are interested in adding your own ruffle, here are a few extra steps in addition to the tutorial I wrote for FreeSpirit. Cut 2 strips 5" x WOF. For the smaller bag I'm guessing (2) 5" x 30" strips would be adequate. Trim selvages. Sew short ends together creating one large circle. Press seams open. Fold with wrong sides together, and press in half along the entire length of the circle. Sew a long basting stitch and gather entire circle into a ruffle that fits the top of the bag. Pin ruffle to the right side of one sewn bag section. I prefer working with Wonder Clips on a project like this. Sew 1/4" seam around the perimeter of bag attaching ruffle. Attach handles to other bag piece then sew both bag pieces together as described in the tutorial with the exception of using a 3/8" or 1/2" seam to sew the top. It's easier to deal with the ruffles with a larger seam. This is the tricky part. Once bag pieces are sewn together, turn right sides out, fitting the lining into the outer bag piece. Edge stitch around the top of the bag, sealing the hole used for turning the bag. Hold ruffle and handles out of the way. Go very slowly and pin hole well. TaDa! A very girly change to a very simple tote! Even with the ruffle, this bag didn't take long at all. It's a simple tote, but a perfect gift wrapping alternative to paper gift bags. FreeSpirit has provided a little goody to giveaway for this last stop of the Christmas blog hop. Just leave a comment to win a fat quarter bundle of 15 FreeSpirit solids! Giveaway ends Friday. Please make sure I have an email for you to win. Oh these solids are so dainty and pretty. I love them!! Cute bag! Thanks for the chance to win! Oh I love free spirit solids! Thanks for the giveaway! I love the bags! the ruffle would also be popular at our house! That ruffle addition is so cute! Thanks. Thanks for the giveaway. Those are some lovely shades. Kati I love these bags and the addition of ruffles is perfect! I wish I had more time to make some for my gift giving. Love the ruffled version! And cute fabric contrast you used! Those bags are a wonderful idea. Thanks for the giveaway! I love those colors of the freespirit fabrics! love the stiped ruffle on the red bag! LOVE the ruffled version! I cannot wait to get home and try this tutorial out!!! SO excited! :) We flew this year, so we didn't make it through SLC, but we are up at the Cabin. Are you coming at all? Peter flies into Idaho Falls today. It's just lovely up here! Hugs! I can always use solids! Thanks for the giveaway! The bag with the ruffle just kills me. This would be perfect for a little girl!!! Now that is girly-i-cious!! What a sweet tote, ideal for giving or receiving! Fantastic!! Those solids are so pretty. Thanks for the opportunity! Very cute ruffle bag! Thanks for a chance to win. I love your ruffled bag. Thanks for hosting this gave away. Love the sassy little ruffle! Thanks for the great tute! Kati - your bags are divine! The frill adds a little something special. Love that big bag! How fun it would be to stuff full of presents for someone. Adorable bag! Thanks for the chance to win! That is a lovely bag! Thanks for the chance! Swoon. Solids. Most of my solids are bold colors so I would really enjoy adding this ones in. I never think to buy solids so when I want one in a project I can't dig into my stash and find one but if I won this bundle I'd solve that problem instantly. This looks great, Kati! I love the ruffle you added. Nice idea! I can see why your daughter loves it. This ruffled bag would be a big hit here at our house! Might be able to squeeze it before the BIG day! Thanks for the chance. Very cute bag! Love free spirit solids, so nice. What pattern did you use? The ruffles are a very cute addition to the bag. Pastel fabrics are so soft and lovely - thanks for the chance. These are great, Kati! I just need a few extra days before Christmas to fit in all of my projects! love the bag! and the solids are awesome! great to use with any project. Thanks. You ruffle bag is beautiful. Love the fabric choices. the ruffles are so happy! That ruffled bag is just adorable! I love it! I have never worked with ruffles before, but will have to give it a go now that I see how easy it should be. Thanks for the tutorial! Free Spirit solids are the best. Thanks for the chance to win. I love the ruffle idea. It's a darling bag!! Love the ruffle bag. I used Kumari Garden for my granddaughter's nursery ensemble- this pink fabric was used for the bumper pads. So cute. Thanks for sharing. Love the bag!! So cute! I love the ruffled edge on this. It would be a great wedding party gift bag! The ruffle turned out really fun! It makes me want to sew some gift bags! Your ruffle version is so cute! Great idea! lovely bags and lovely solids! Thanks for the give away! The ruffle is so cute. My two girls would definitely love it. This gives the bag a WOW factor. Thanks for the chance to win those fabulous fabrics. Wow those ruffles are awesome - great tip with those clips! WOW! Your bag with the ruffle is just adorable! I am not usually a 'bag maker' but I am sorely tempted by this design. Thanks so much for referring back to the original tutorial, and for showing us how to include a ruffle! I cannot wait to try it. Happy holidays! What pretty solids and what a generous giveaway. Thanks for the opportunity to win. Ooooh! SOLIDS- how wonderful! Your bag with its ruffle is gorgeous! Of all the bags I have to side with miss A and say that I like the ruffle bag best too. Nice job! Thanks for the ruffle tutorial. Visuals are always the best for me. A great-looking bag and a nice easy-to-follow tutorial. Good job! I love this bag! I am a big fan of reducing packaging for wrapping... Btw, I need to point out that we have the same sewing machine (I think!). I love my brother and it is such an inspiration to me that you make such beautiful quilts on your machine! It says spring to me! Thank you so much for the giveaway, I haven't worked with this brand of solids before. So pretty....much nicer for gift giving than the simple drawstring bags I made! Gorgeous gift bags, and the ruffle is a genius addition. Definitely going to give this a go! Thanks for the opportunity to enter the giveaway! The solids are very pretty. Your gift bag idea is great. Love the ruffles. The bags are awesome....thanks for the giveaway. Merry Christmas and Happy New Year! May the coming year bless you and your family with everything that your hearts desire. Love the medium sized bag with the ruffle. Absolutely stunning. Great colors & great design. I love the ruffle - it turns the ho-hum bag into a real beauty! Love the ruffles! Great idea! That Kumari Garden fabric is beautiful. Thanks for the great giveaway opportunity. Love the solid fabric and the tutorial. What a fab frill for the tote - jazzes it up so nicely!! And wow what a generous giveaway! I use solids a lot and these are grorgeous colours :) Thanks for the chance!! adorable bags! I can see why your daughter claimed that one, it's pink and has a ruffle! what could be better? 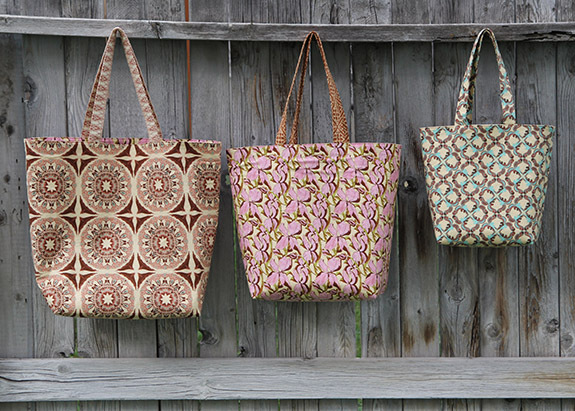 Great totes! And love the fabric! Cute bag! I love the ruffles. Thanks for the giveaway! The bags are wonderful, great giveaway on these lovely solids!! The ruffle is adorable. Love it. Love the ruffle to the bag - sooooo sweet! Thanks for sharing in the blog hop... I have really enjoyed it!! This is a lovely idea for wrapping -- a gift in itself! I have made a couple of reusable gift bags which are essentially pillowcases with zippers. They work very well but tend to live in the drawer the rest of the year. I just love this bundle. Thank you!! I really like the ruffle. It would be great for as a gift and as a gift bag. Thanks for the tutorial and the giveaway. I adore these bags with and without the ruffles. How creative and fancy. Love how you added the ruffle. Thanks. Ahh, one can never have too much fabric, and solids make this giveaway even better. Thank you for the chance to win. Love the addititon of the ruffle! Makes me want to make one immediately. Nice bags, the ruffle really adds. I made a bunch of easy bags, no handles, no lining, ribbon to tie them. I like to use them instead of wrapping paper too. Yours are ever so much nicer. Thanks. I love the ruffle bag and the fabric it is made it...my kind of bag. What a generous giveaway! Thanks so much for sharing! always needed! Thanks for the chance to win! How wonderful! And just in time for Christmas. Thank you! what fortuitous timing (for me)-- I was thinking about creating some simple gift bags to hold some quilts that I'm (still!!) making for Christmas gifts. Your ruffled bag looks great...thanks for the tutorial! What a great bag - thank you for the tutorial! Those solids are lovely. How fun it would be to win, but its fun just to be able to enter. Thank you! Very cute gift bag, good thinking! The fat qtr bundle looks like an awesome Easter quilt wanna be! Such a pretty, girly bag. The ruffle makes the bag! I'm working on a tote at the moment, well trying anyway. It's turning out to be one of those two steps forwards 3 steps back kind of day. Thanks for a great giveaway. Oh, I do love a good tote bag and its such an easy grift to make. Cute bag. Love the ruffle. Lovely tutorial, thanks for sharing! And thanks for giving us a chance to win those so so nice solids. They are welcome anytime in my stash! Amazing how the ruffle changes the look of the bag! Thanks for the tutorial - will try this with my next batch of totes. Great bags! I'm going to give it a try! Great idea with really cute bags. Love the tutorials - both with and without the ruffle! Thanks for the chance to win the solids bundle - it is just what I need!! Thanks for the extra tips on adding a ruffle to the bag! I would love to win your giveaway! Love the idea of making bags instead of wrapping presents up, like two presents in one!!! Lovely soft colors on this bundle....! What a great idea! I'm all about useful wrapping. Thanks! How lovely! These solids would be a great addtion to any stash. Thanks for the chance to win. I love these! The simple versions showcase the fabric brilliantly, and even my smallest nephews would immediately re-purpose the gift bags for car & dinosaur haulers. And the ruffle version is AWESOME!! That ruffle is really cute! The wonder clips you are using instead of pins look really useful too, I can see that I'd lose pins in all the ruffles and end up sewing over them! What a fun bag! I would love to make bags (next year) to use instead of all the wrapping paper. Thanks for the cute idea and tutorial! Awesome tutorial Kati, I adore the ruffle idea! I'llhave to pin the tutorial with the size chart. Thanks for putting it together! Have a Wonderful Christmas! Wow! How cute this becomes with the ruffle added. The stripes are a wonderful addition. LOVE the girlie and gorgeous bag you have made. I adore the pastel solids too. My stash could use some solids, and these would make a gorgeous addition. Thanks for the chance.